Romania has its first World Series of Poker bracelet, and it's none other than top poker talent Alexandru Papazian with the gold jewelry on his wrist. On the extra fourth day of play in the hugely successful $888 Crazy Eights tournament, Papazian defeated Germany's Kilian Kramer to take home the first-place prize of $888,888. On the third day of play — what should've been the last day of the tournament — the last table was reached after several hours of play. The final nine boasted many top European players, but the only two-time bracelet winner among them was Nevada's own Ben Yu. Unfortunately for Yu, he couldn't find any luck as he lost a vast majority of his chips when he got it in good, only to get three-outed by James Cappucci. Yu lost his remaining bits a few moments later, running into Harry Lodge's aces. Kramer maneuvered his big stack with an aggressive approach, but he doubled up Lodge twice and Cappucci once. Papazian took over the chip lead just before the dinner break, and his one-man show started thereafter. After two levels without any bust outs, Papazian finally knocked out Guillaume Diaz in eighth place. His ace-king held strong against Diaz' ace-queen, eliminating the French player for a $86,888 payday. Papazian's next casualty was Michael Tureniec who departed after pushing in his remaining seven blinds over Papazian's raise, but his ace-deuce found no luck against pocket eights. Tureniec collected $112,888 for his efforts. Papazian was steamrolling over the final table, and his heater had no mercy for his fellow countryman Vlad Darie. 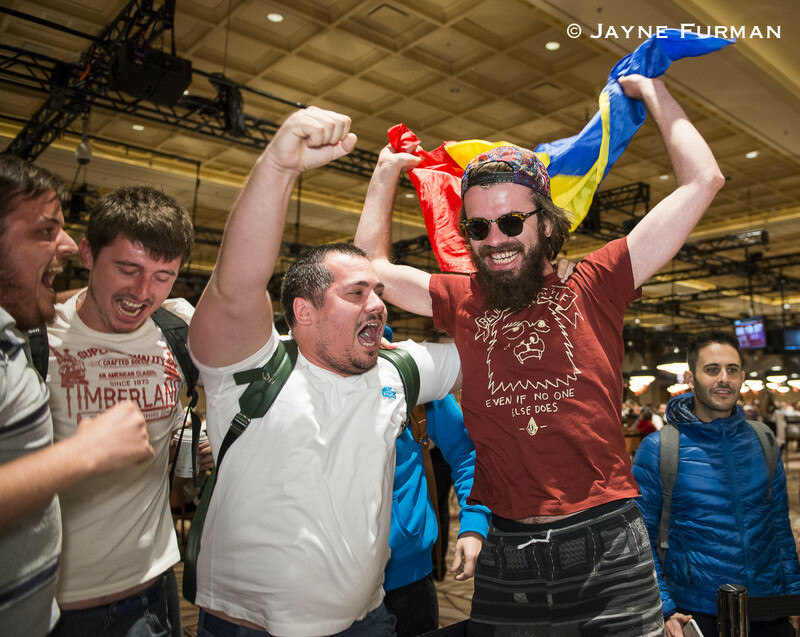 Both dressed in Romanian national soccer team shirts and cheered by a loud rail, Papazian and Darie tangled preflop. Papazian's ace-king bested Darie's pair of jacks, sending Darie to the payouts for the $146,888 sixth-place prize. Two hands later, Papazian added yet another casualty to his list as James Cappucci, who laddered several pay jumps with his short stack, finally met his fate. Papazian had only two live cards in their all-in confrontation, but he turned a flush to bust Cappucci in fifth place for a $193,888. Papazian's streak continued with the elimination of Ioannis Angelou Konstas, who shoved ace-deuce of spades only to find Papazian calling with eights. Konstas picked up $257,888 after busting in fourth. Harry Lodge and Kilian Kramer were sitting in their chairs quietly, watching Papazian destroying the table. With the tournament down to the last three players, Papazian had already accumulated 80 percent of all chips in play. Papazian didn't add the sixth name among his scalps as Lodge and Kramer clashed with each other. Lodge had ace-eight of clubs and outflopped Kramer's kings, but Kramer caught a king on the river to send the English player out. 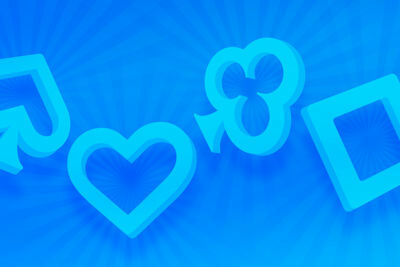 Lodge received $344,888 for third place. Papazian and Kramer quickly agreed to wrap up the night before starting their heads-up match. When they returned to the Rio All Suite Hotel and Casino, the Amazon Room was the stage for the final battle. After some back and forth, Kramer eventually lost a big hand to leave his stack crippled. In that hand, Papazian three-barreled and Kramer check-called all the way. Papazian turned out to have had nothing on the flop and just a straight draw on the turn, but rivered top pair which he value bet. Kramer couldn't beat that and had to continue with fewer than 13 big blinds. He shoved those all in the next hand, getting called by Papazian. Kramer showed six-nine suited and was in a lot of trouble against the king-nine of Papazian. The latter flopped top two and it was all over after the turn bricked. Whether or not his heads-up opponent, German Kilian Kramer, will participate in that competition is currently unknown. Hand #154: Killian Kramer contemplated what to do for just a bit before he announced all in from the button. Alexandru Papazian, still busy stacking the chips he had won in the last hand, glanced at his cards and asked for a count. The dealer counted out Kramer's stack and came to 1,275,000, but was missing the 5 million even Kramer had back. When he eventually announced it was 6,275,000 total, Papazian called. The flop just about settled it: . 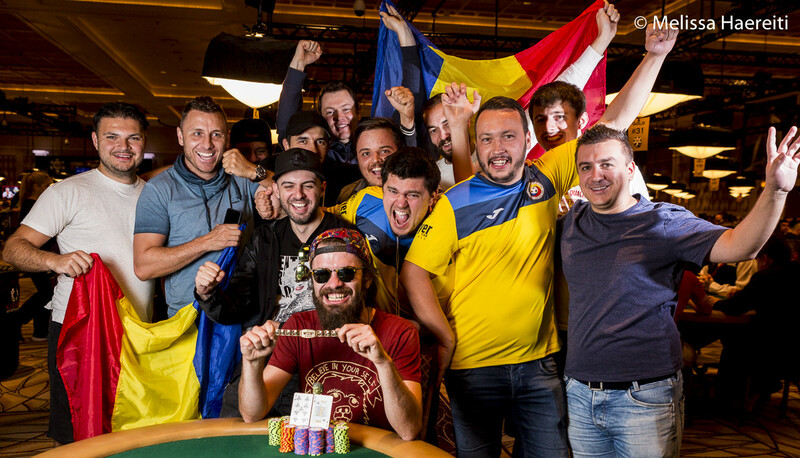 After the flop, Papazian was already on the rail with his friends, wearing the bright Romanian flag as a cape. As the hit the turn, the real celebrations began. The meaningless on the river was there just to make things official. Kramer had to settle for second place, worth $463,888. Hand #151: Kilian Kramer received a walk. Hand #152: Kramer gave Alexandru Papazian a walk. Hand #153: Papazian Papazian raised to 1,250,000 and Kramer called. On the flop, Kramer checked and Papazian continued for 1,300,000, which Kramer called. On the turn, Kramer checked again and called a bet of 3,500,000 by Papazian. The river completed the board and Kramer checked for the third time. Papazian bet 6,500,000 and Kramer gave it plenty of consideration before calling. Papazian rolled over for top pair on the river, having bluffed the flop and picked up a straight draw on the turn. Kramer mucked and fell down to less than 13 big blinds. Hand #143: Alexandru Papazian folded, giving Kilian Kramer a walk. Hand #144: Kramer opened for 1.1 million, Papazian folded. Hand #146: Kramer opened for 1.1 million but folded to Papazian's three-bet to 3.7 million. Hand #147: Papazian opened for 1,250,000 and Kramer folded. Hand #148: Kramer opened and Papazian folded. Hand #149: Papazian opened and Kramer folded. Hand #150: Kramer opened for 1.1 million and Papazian defended. Papazian checked on and folded to Kramer's 1.1 million-bet. Hand #138: Kilian Kramer raised to 1,100,000 and won the big blind and antes. Hand #139: Alexandru Papazian raised to 1,250,000 and that won the big blind and antes. Hand #140: Papazian received a walk. Hand #141: Papazian made it 1,250,000 to go and Kramer called. On the flop, Kramer checked and Papazian continued for 1,300,000, which Kramer called. Kramer also checked the turn, resulting in a second barrel worth 3,500,000 by Papazian. Kramer called and checked the river. Papazian bet 6,500,000 and that won the pot without showdown, as Kramer folded. Hand #142: Kramer raised to 1,100,000 and Papazian called. The flop of saw both players check and Papazian bet the turn for 1,200,000. Kramer raised it up to 4,000,000 and Papazian folded. Hand #133: Alexandru Papazian opened the button for 1,250,000 and Kilian Kramer called. Both checked the entire board of down and Kramer showed a winner with . Hand #134: Kramer opened his button for 1.1 million and Papazian called. Papazian check-called a bet of 1.1 million on and another 3 million on the turn. The on the river saw both players check and Papazian showed for third pair. Kramer tabled and took down the sizable pot. Hand #135: Papazian opened for 1,250,000 and Kramer folded. Hand #136: Kramer opened for 1.1 million and Papazian folded. Hand #137: Papazian gave Kramer a walk. Hand #129: Alexandru Papazian raised to 1,000,000 and Kilian Kramer called. On the flop, Kramer checked and Papazian continued for 1,000,000. Kramer called and both players then checked the turn and river. Kramer showed for a pair of kings and Papazian won the pot with for a flush. Hand #130: Kramer raised to 900,000 and Papazian three-bet to 3,000,000. Kramer gave it some thought and moved all in, which resulted in a fold from Papazian. Hand #131: Kramer received a walk. Hand #132: Kramer raised to 900,000 and Papazian called. The flop fell and Papazian checked, which prompted Kramer to bet 900,000. Papazian check-raised to 3,300,000 and Kramer let go. Hand #125: Alexandru Papazian opened the button for 1 million and Kilian Kramer called. Both checked on and the on the turn was seen for free. Kramer checked again and folded to Papazian's 1.2 million-bet. Hand #126: Kramer folded his button, giving Papazian a walk. The Romanian pro showed to have received a walk with . 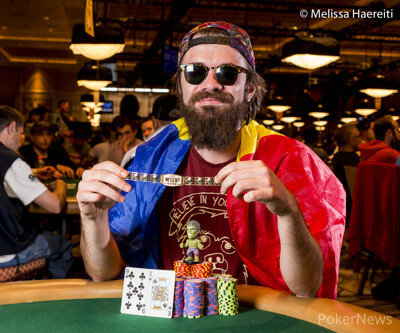 Hand #127: Papazian opened his button for 1 million and Kramer three-bet to 3.2 million. Papazian folded. Hand #128: Kramer opened his button for 900,000 and Papazian called. Both checked the flop of and the turn before the completed the board. Papazian checked again and called the bet of 1,150,000 that followed. Kramer showed for two pair with a king kicker. Papazian tabled for the same two pair but the inferior kicker.